Searching for Pet Sitting Services Near Me? Try Us! If you’ve visited our Brookland location, you know that between our day care and boarding pups, Patrick’s Pet Care: Brookland is always the center of activity. 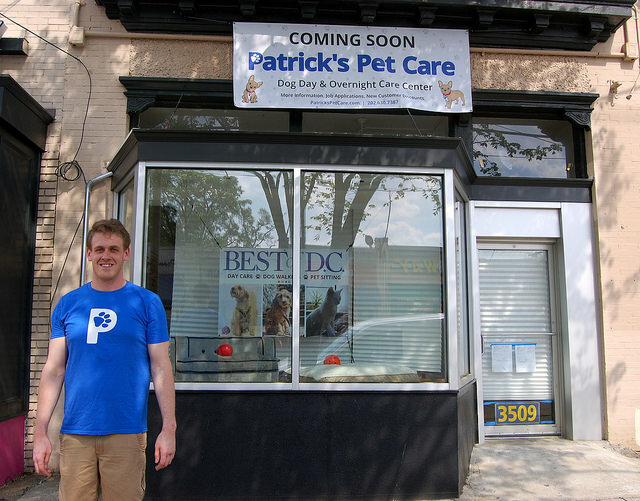 But what you may not know is that Patrick’s Pet Care: Brookland serves as a hub for our community engagement work as well. Beginning this past summer, our Brookland staff have worked hand-in-hand with Deaf-REACH, an organization that provides specialized programming for deaf and hard of hearing individuals in the D.C. area. The team from Deaf-REACH visits PPC: Brookland to see how the day care business operates and give our day care pups some extra socialization and love (including handmade treats!). At their last visit, the Deaf-REACH team created a lovely poster for our day care pups (pictured below). Our staff loves having them at the day care and looks forward to each of their visits. We have also been fortunate to partner with Lucky Dog Animal Rescue by serving as a boarding facility for some of their dogs while they await adoption. During their stay with us, the Lucky Dogs receive supervised socialization time, prepping them to be well-behaved in their forever homes. One of those rescue dogs, Rhonda, has made amazing strides thanks to the work from our Brookland staff. When Rhonda arrived to stay with us, she was anxious and avoided socializing with people and pups alike. But our Brookland staff worked with her each and every day, easing her into her new life with people to love her, and dogs to be her playmates. A once standoffish stray, Rhonda is now full of energy and loves playtime with her day care buddies. She’s begun her adoption process, and we can’t wait to see what home is lucky enough to adopt her! With the holiday giving season fast approaching, please consider a donation to either of these wonderful partners. And if you’re looking to board your dog or enroll them in day care, know that your choosing Patrick’s Pet Care helps us strengthen these relationships with organizations performing essential services in our community. If you live in our service area, you’ve likely seen one of our caretakers zip by on a bike while commuters in cars slog along in traffic. It’s no surprise why so many of our caretakers opt to bike in the city. Biking proves to be one of the fastest ways to get around town. But there are more benefits than just a faster commute when biking. Recent studies illustrate that commuters who bike are generally happier than their automobile-bound colleagues. In our line of work, working with animals who are attuned to our feelings, happy commuters make for happier dogs. That is why we were pleased to recently accept the 2018 Bike-Friendly Workplace award for a small business from the District Department of Transportation’s goDCgo initiative. At Patrick’s Pet Care, our caretakers are given a free Capital Bikeshare membership to use both at and outside of work. For caretakers that need to cover lots of ground, we maintain a fleet of Riide e-bikes to help keep their legs fresh as they get across town. And we cover the cost of routine bike maintenance for employees who use their own bicycles. Ultimately, we know that giving your pets the best possible care requires making Patrick’s Pet Care a good place to work. And that’s why bike benefits are just one of the perks offered to our employees. So the next time you’re stuck in traffic, and a person wearing a blue t-shirt emblazoned with the Patrick’s “P” whizzes by you in the bike lane, know that there’s a dog nearby whose day is about to get a bit brighter. Patrick’s Pet Care is thrilled to announce our latest addition: a 5-star cat hotel! We love taking care of boarded dogs, so we wanted to extend the option to cats as well. Our feline friends should be able to have a fun time when mom and dad are away too! The hotel doubles as our administrative office. Imagine it as a cat café, except a cat office. While the administrative staff of Patrick’s Pet Care are at work, the staff get to enjoy the feline companionship and vice versa. We currently have two different options for your pet’s stay: Kitty Condo or Free Reign. In the Kitty Condo, your cat will be comfortable in a large tiered enclosure complete with litterboxes, food and water, and multiple toys. If your cat would be more comfortable with a bit of wandering, we do have a limited amount of spaces for free reign cats. With this option, your cat has free reign in our office with the ability to explore and endless attention from our staff! Both boarding options are very reasonably priced. Your cat can stay within their own enclosure at the kitty condo for just $30 a night. If they want the more spacious option (free reign), it will cost an additional $10 a night. Treating your pet while you are away is easy at these prices. We pride ourselves on the top-notch accommodations we provide for your pet. During your pet’s visit, they will be under supervision for 12 hours with plenty of socializing (with humans or other pets!) and playtime. We keep to their normal meal schedule to so there aren’t any unnecessary disruptions. At night, they have a quiet and comfy place to sleep. In addition to all of this, we provide email updates on how your pet is doing on Tuesdays, Thursdays, and Sundays. We know you can’t help but worry about them, so we do our best to make sure you can enjoy your time away. As we briefly mentioned above, this service is not restricted to cats; we are also able to house small animals like rabbits, ferrets, and guinea pigs. Give us a call today at 202-630-7387 to schedule your pet’s stay!